I did it ... 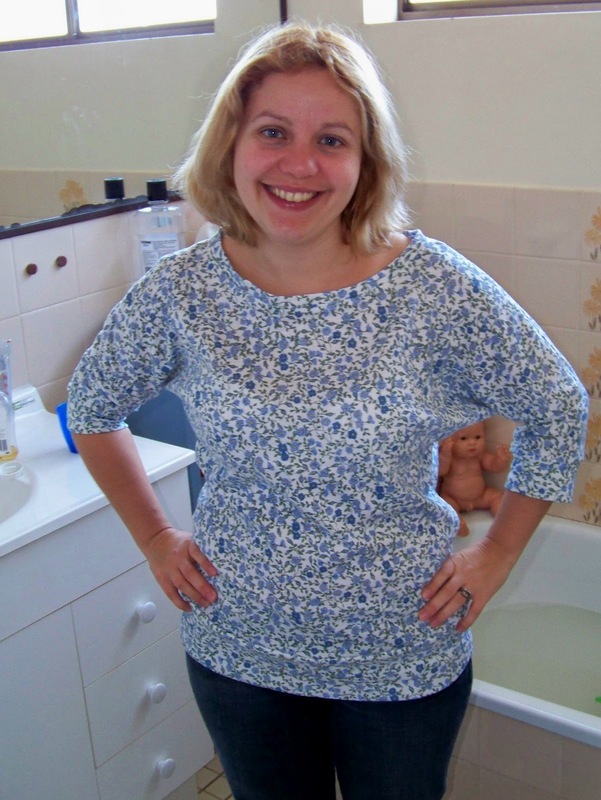 I sewed a top with Jersey like material. I think it's actually interlock, but I am not sure. It was a mystery purchase from fabric-a-brac. I used the free Dolman Sleeve Top pattern from Cation Designs. It came out alright, although the directions say that you should sew the sides with a straight stitch and the first time a did it and then tried it on the stitches ripped where the sleeve turns down the side. I just resewed it with a zigzag stitch and it was fine. I might make one more version from it with a lower neckline, but it's getting warmer now so it's back to T-shirts. Oh yay, someone tried it! I guess the zigzag makes more sense under the arm, but that's what happens when you only test it on yourself :) Thanks for the feedback, and for letting me know you tried it! Yours turned out very nicely! Would it be okay if I used your picture and linked to you at some point when I get to doing a roundup of people who have tried the pattern? That looks great on you. The print is a good colour for you and the style is very flattering. You can always use a reinforcing row of stitching on the next version, but it sounds like you've nailed this pattern, without it.